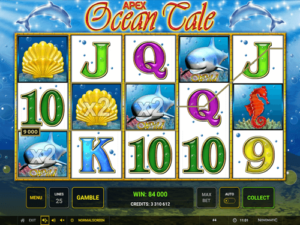 Novomatic likes to make underwater slot games, with other examples including: Dolphin’s Pearl Deluxe, Sea Beauty, Mermaid’s Tale and Mermaid’s Pearl. Despite being a new slot from this games provider, Ocean’s Tale doesn’t have very modern graphics. It does, however, have a very impressive RTP which stands at 95%! This means there are big cash payouts to be won in Ocean Tale, especially if you find the sunken treasure and trigger the Free Spins. When you play Ocean Tale, you’ll be spinning the reels at the bottom of the sea floor. Some sunlight penetrates through to the seabed, so you can see the sand and the seaweed and the coral. The logo is quite fairy tale like, with two jumping dolphins on either side. On desktop, all the settings are found under the reels. Here, you can adjust the value of your bet; turn auto on or off; open the menu and spin and stop the reels. When you win a payout, the gamble option will also be available here underneath the reels. You have to turn auto off if you want to play the gamble game. Many sea creatures are featured in the game, and most of them appear as symbols on the 5 reels. Being a Novomatic game, the reels spin and stop with a satisfying click! Anyone familiar with Novomatic slots will recognize the music and the sounds immediately! Ocean Tale has 25 paylines so there are 25 ways to win! Every slot game spins a tale of its own! Sometimes you win, sometimes you lose, but it’s always fun to play! To play a slot, you must spin the reels. Every time they stop, they will show different symbols in different combinations! You can let them stop on their own or you can stop them while they’re spinning to see if you can get more wins that way! Wins are paid for matching symbols when they cover the positions on a payline. Ocean Tale’s paylines pay one way, from left to right. Aside from the Scatter symbols, which pay in any position, the symbols have to land consecutively from reel 1 towards the right, in positions that follow a payline. There are 12 symbols in total, including the Scatter symbol. 9, 10, J, Q, K and A are the card value symbols. These card symbols award smaller wins than the picture symbols, which is pretty standard in Novomatic slot games. The picture symbols are: the starfish, the clamshell, the seahorse, the goldfish and the shark. The Scatter symbol is a treasure chest. The only symbols that can pay wins for 2 matches are the 9, the goldfish and the Scatter symbol. All other symbols (including those symbols) pay wins for 3, 4 and 5 matches. You might want to avoid scary sharks in real life, but in Ocean Tale the shark is the most valuable symbol. You’ll be excited to see this great white land on the reels! Not only because it pays the biggest wins, but also because the shark is the Wild symbol and stands for all symbols except the treasure chest Scatter. If the reels stop, or you stop them yourself, and you can see three treasure chest symbols, you’re in for a treat! This triggers the bonus game. In order for the bonus game to begin, you must pick a treasure chest. The treasure chest you choose will open and inside will be revealed the number of Free Games you’ll get for the bonus. The number of Free Games you get is random and will depend on the colour of the pearl that you find within your chosen chest. Treasure chests can give you 10, 15, 20, 25 or 30 Free Games! The brown pearl gives the lowest number of Free Games and the black pearl gives the highest number. You will play your bonus games on the same reels as the normal game and it will work the same, except that all of your wins will be doubled! The multiplier of x2 will be applied to every win you get during the Free Games. The only wins that won’t be doubled are the shark wins (i.e. combinations of only the shark symbols). Wins of other symbols, like the seahorse, that are completed with a shark Wild will still be doubled. If, while you’re spinning the reels for your Free Games, the reels stop and you can see another three or more treasure chest symbols, you’ll win some extra Free Games. These will be added to your total number of Free Games and they’ll be played consecutively, before you return to the normal game.